Monks and Bedouins Join Forces to Protect Manuscripts. 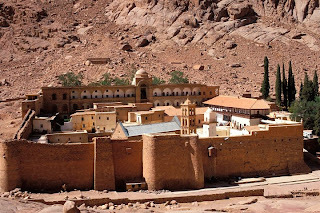 Saint Catherine's Monastery is situated in the Sinai Peninsula at what has been identified by some as the biblical Mount Sinai. While it is difficult to know whether this is the mountain where Moses and the Israelites camped while receiving the law from God, it is a religious site frequently visited by tourists. In addition to its connection with biblical history, the monastery is also known for its cache of ancient manuscripts and codices including the famous Codex Sinaiticus, the oldest most complete Bible. In the last decade or so the humble monk who live there have begun an effort to digitize those manuscripts in order to preserve them and make them more widely available. But as you may have heard, the political situation in Egypt hasn't been very stable. The monks were concerned that there might be some form of attack against the monastery, but as Time Magazine reveals, the monks generosity and hospitality in the past has paid off. 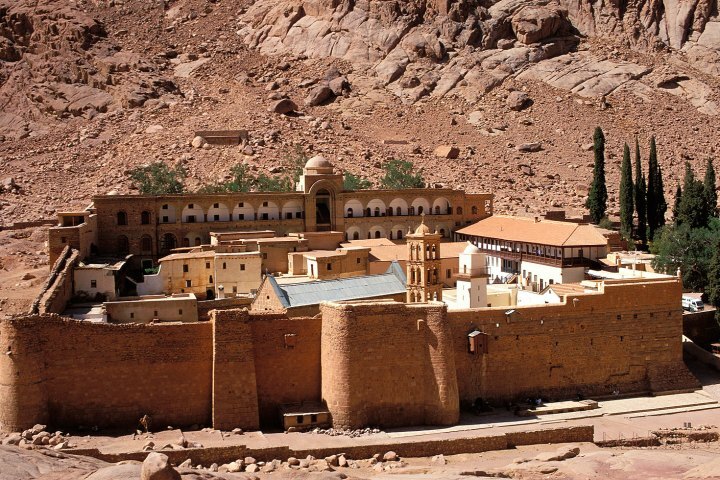 Just as they have done for 17 centuries, the Greek Orthodox monks of St. Catherine’s Monastery in Egypt’s Sinai desert and the local Jabaliya Bedouins worked together to protect the monastery when the 2011 revolution thrust Egypt into a period of uncertainty. “There was a period in the early days of the Arab Spring when we had no idea what was going to happen,” says Father Justin, a monk who has lived at St. Catherine’s since 1996. Afraid they could be attacked by Islamic extremists or bandits in the relatively lawless expanse of desert, the 25 monks put the monastery’s most valuable manuscripts in the building’s storage room. Their Bedouin friends, who live at the base of St. Catherine’s in a town of the same name, allegedly took up their weapons and guarded the perimeter. The two-plus years since the toppling of former President Hosni Mubarak have been unsettling for Egypt’s Christians, the majority of whom belong to the Coptic Church and account for a significant minority (up to 10%) of the country’s population. There have been violent clashes between Christians and Muslims, with deaths on both sides. St. Catherine’s has nevertheless maintained its track record of friendly relationships with its Muslim neighbors. The Greek Orthodox monks and the Jabaliya Bedouin tribe, who are the area’s majority residents, have shared land, food and friendly relations since the monastery was built centuries ago. The Jabaliya are believed to be descendants of the Byzantine soldiers who built the monastery in the 6th century, and many of them continue to guard the monastery as their own. “The monastery is a very special place for me and all Bedouins. It is a holy place for all religions. Our ancestors built St. Catherine’s,” explains Ramadan, 26, who has been a tour guide at the monastery since he was 15.